Our mill produce A53 Hot Rolled Carbon Steel Pipe Gambia,A53 Hot Rolled Carbon Steel Pipe Mill Gambia,ASTM A53 Seamless Pipe Gambia,ASTM A53 carbon seamless pipe Gambia,welcome u and u team come to visit at any time. 3.Length: 5-12M random length or 6m fixed or 11.8m fixed. 5.Packing: Hexagonal bundles of max. 2,000kg with 6 steel strips bundles, black paint coating,beveld ends or plain.Caps both ends. 6.Delivery Tollerance:+-10%,or +-8% or +-5%of total quantity and amount. 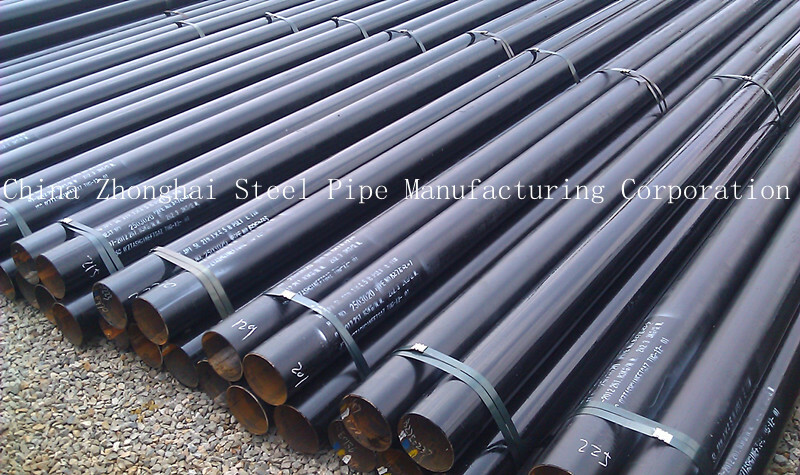 7.A53 Hot Rolled Carbon Steel Pipe Test:Chemical Component Analysis,Mechanical Properties(Ultimate tensile strength,Yield strength,Elongation),Technics Properties(Flattening Test,Bending Test,Hardness Test,strike Test,etc), Exterior Size Inspection, Nondestructive Test,Hydrostatic Test. 8.Heat Treatment: BK, BKS, GBK, NBK,Stress Relief, Normalizing, Spheroidize Anneal, Annealing, Bright Annealing, Normalized, Quenched and Tempered, Solution Annealing, etc. 11.Payment: TT 30% or 30% prepayment balance by Irrevocable LC at sight. 12.ISO Certificate,offer Material test cetificate EN10204.1B,third party inspection SGS,BV,TUV etc. This entry was posted in Carbon Steel Pipe. Bookmark the permalink.